TERRY PRATCHETT is one of the most popular authors writing today. He lives behind a keyboard in Wiltshire and says he 'doesn't want to get a life, because it feels as though he's trying to lead three already'. He was appointed OBE in 1998. He is the author of the phenomenally successful Discworld series and his trilogy for young readers, The Bromeliad, is scheduled to be adapted into a spectacular animated movie. 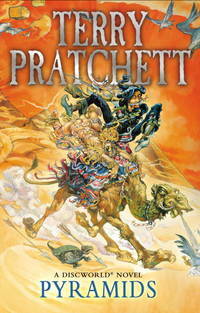 His first Discworld novel for children, The Amazing Maurice and His Educated Rodents , was awarded the 2001 Carnegie Medal. Corgi. PAPERBACK. 0552166650 Book is in good condition. Cover has some wear. Creasing present. Discolouration present. Fingermarks present. Sloping spine. -- Re-Read is a social enterprise that trades in and recycles books to reduce waste, save them from landfill and provide services and activities that promote literacy, education attainment and quality of life in South Yorkshire and supports Askern Community Library. All overseas shipping is via Airmail. . Good. Paperback. New. 'Look after the dead', said the priests, 'and the dead will look after you. 'Wise words in all probability, but a tall order when, like Teppic, you have just become the pharaoh of a small and penniless country rather earlier than expected, and your treasury is unlikely to stretch to the building of a monumental pyramid to honour your dead father. Corgi. PAPERBACK. 0552166650 Brand New ,Original Book , Direct from Source , Express 5-8 Business days worldwide Delivery. . New. Corgi. PAPERBACK. 0552166650 . Very Good. Terry Pratchett - Pyramids - Paperback. Book. BRAND NEW.